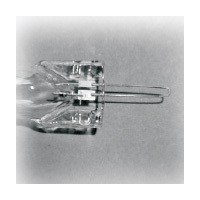 We produce wire-laminated foils for sealing in quartz glass. These have a lanceolated cross-section profile and a roughened surface, so that optimum adhesion can be achieved between quartz glass and metal. Molybdenum is used in their production – a material with a very high melting point, low vapour pressure and extreme heat resistance. It also has a low specific heat and thermal expansion as well as good conductivity. A molybdenum material doped with yttrium is produced for special uses; this produces better weldability and an outstanding adhesive strength of the foil in quartz glass seals. 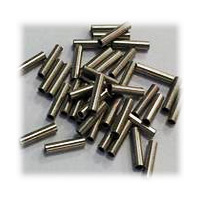 The recrystallisation temperature is increased to around 1400° C compared to pure molybdenum. Further, molybdenum doped with potassium silicate is also offered, whose recrystallisation temperature reaches around 1700° C. Modern production technology and the use of laser and computer technology in quality management, coupled with decades of experience and first-class know-how, enable our company to guarantee a uniformly high product quality. We produce wire-laminated molybdenum strip with a bright surface for different applications, e.g. 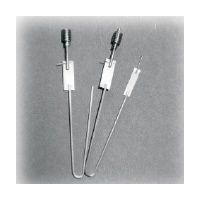 the production of molybdenum tubes as a welding aid for welding filaments or electrodes as components of lamps. As NARVA G.L.E. uses the foils it produces in its own lamp production, our customers can be sure that all knowledge acquired from the processing of this product is continuously incorporated in the constant quality control and further development of our molybdenum foils.